It seems when you are attempting to prospect and sponsor people into your network marketing business, you always hear objections. Most of this happens when you are new, and when you are still in your learning curve. 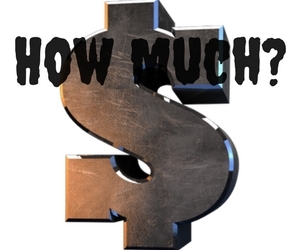 So I want to touch on another network marketing objection which is the “How much are you making?” objection. If you are new to network marketing, chances are you’re not making much or anything at all. This makes that objection hard to overcome since it never sounds good to say I’m making nothing, or very little. So try this response next time you hear “How much are you making” network marketing objection. 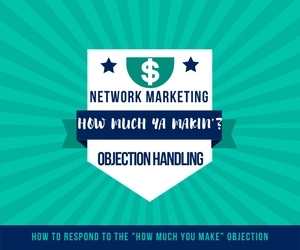 People throw network marketing objections at you because they are trying to either get out of the presentation, or to make you look small so they can look big. So you need to have answers to the most common MLM objections like this, so you can defend your ground, and keep the conversation or presentation under your control. If you are new to network marketing, consider the amount of hours you have put into it, not the actual days. For example, you may have been involved in network marketing for a month, but only worked a few hours a week. It helps to answer this objection using the small amount of hours instead of the months/days/weeks. If someone asks “How much are you making?” and you have made nothing so far, you can reply with “I am new as of now, and only worked my business for a total of 15 hours. So ask me again when I have a full month or two into it. My sponsor on the other hand, who you will be working with, comes out to make about $100 an hour (based on 30 hours at $3,000 a month)”. Many people will look at this opportunity in the eyes of an employee, not a business owner. Speak to them on their level, and to their understanding. Saying what they make an hour, and using examples of others who are working the business in your team, can be the ticket to giving a fair amount of what is possible with the opportunity. Some people will come at you with “What did you make your first month” since most MLM opportunities are based on monthly income. If this is ever the case, using the line below will surely help, and make a prospect see the big picture. “How much did you make your first month” can be answered with “Well I can tell you once I’m finished getting paid for it”. This can help them to see, that work put in today, can pay you for a long time to come. This is where the true wealth is made in network marketing. Through residual. If they ask what that means, simply explain how you are paid over and over again for the work you did years ago. If you have made a lot in this industry, or not, there is a really powerful way you can reply to the network marketing objection “What are you making?”. The truth is, what you are making has nothing to do with what they will be making. So you can always reply with “Well that’s not the right question to be asking me. I work much harder than the average person, therefore I can make a lot more than most people. The real question should be how much of a work ethic do you have, and the comp plan can give you an idea of what you’ll be making”. That’s an honest way to put it to the prospect. It’s all about what they do, and what you have done has no reflection on what they will make. Most of the time people ask so they can determine if it’s worth the time put in, so be sure to reply in a way that can really open up possibilities for them. Network marketing objections will be thrown at you all the time. As you get better, you will hear them less and less often. But, you will never escape them fully. Using the amount of hours you have applied over the actual days since the time you signed up, will keep the employee minded person from getting the wrong impression. Also, remember if you have made a check, or have had a few results in your first month (or the hours in a month) then you can always use the 2nd line to let the prospect know you are continuing to be paid for it. It has a lot of power to the response from this common network marketing objection. P.S If you need leads, and people who are targeted prospects for your network marketing business, then go here and you will get leads for life with no monthly subscriptions, or buying over and over. 2 replies to "Network Marketing Objection Handling: How Much Are You Making"
Thanks Mike, that is a good reply!